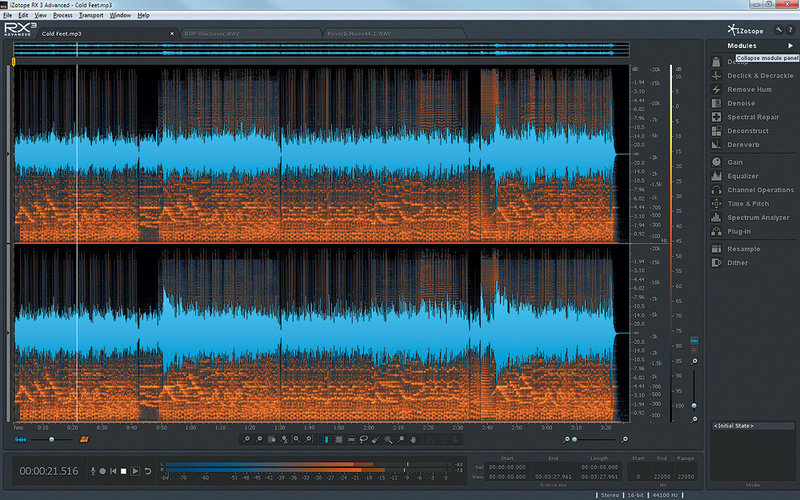 The latest version of iZotope's RX restoration suite does more than before — and does it faster! One of the benefits of the massive processing power now available in modern computers is the ability to manipulate data in ever-more impressive ways, and with ever-greater simplicity and speed. This applies across the whole gamut of computer-based work, but especially to music creation, photographic manipulation and, of course, audio restoration. The last is a relatively little-known corner of the audio industry but one which has really advanced dramatically over the last 20 years, to the point where it's now possible to correct or conceal very serious technical flaws and faults which would have been utterly disastrous at the end of the last century! Specialist companies involved in the audio restoration field (as well as the closely related area of forensic analysis) — for example, the well-known British standard-bearers, CEDAR Audio — have led the way in developing incredibly innovative and sophisticated restoration tools and techniques. Inevitably, these pioneering concepts and technologies eventually trickle down and become available to a wider audience at lower cost, and iZotope have been one of the leading software providers to run with this baton, deservedly winning a 2013 Engineering Emmy for 'RX audio repair technology'. The company's first audio restoration suite released under the RX product name was reviewed in Sound On Sound back in July 2008 (/sos/jul08/articles/izotoperx.htm). While we don't appear to have reviewed its 2010 successor, RX2, we did run an in-depth instructional article on getting the best from it just a few months ago in August 2013 (/sos/aug13/articles/izotope-rx.htm). I've been using the RX suite for a good few years now, and have found it to be a remarkably powerful tool, especially when used in its stand-alone mode. However, I would urge potential users to look upon it as way of restoring or recovering unrepeatable material, rather than as a means of absolving poor recording skills or techniques. What I mean by that is that you'll get far better results — and in far less time — if you address, for example, the causes of hums or buzzes during the original studio recording, rather than trying to remove that hum afterwards with a sophisticated tool like RX3! It's the same with photo-editing software; it's far better to take a good picture than try to make a good picture! With that personal bugbear put aside, I should also point out that calling RX3 an 'audio restoration suite', while perfectly accurate, doesn't really do this software full justice in terms of highlighting the full breadth of its capabilities and applications. Yes, RX3 can be used to repair and restore vintage recordings, and I've used the previous versions to digitise and restore countless reel-to-reel master tapes that are older than I am, removing hums and whines, correcting dropouts and azimuth errors, reducing tape noise, and so on, all with excellent results. But RX3 can also be used to fix a wide range of unavoidable technical issues with present-day recordings too: fixing that one annoying clip on the very best vocal take, removing some of the inevitable background noise from a public performance, minimising the intrinsic mains hum of vintage keyboards or guitar amps, and much more besides. For example, I recently used RX2's spectral editor to remove from a recording of an unrepeatable public concert the sound of a chorister fainting and collapsing, leaving only the chorister's bruises as evidence that it ever happened! RX3's advanced spectral repair module in action. Note the tabs along the top which allow up to 16 files to be open simultaneously in RX3. But that's still not all; for the sound designer RX can be used as a creative tool limited only by the imagination, for generating brand-new sounds by manipulating existing sounds in ingenious ways. One of the major strengths of RX is the ability to process or analyse audio using a variety of selection tools which operate in both the time and frequency domains, and in regular and irregular forms. This makes it possible to work on the audio in a broadly similar way to manipulating a photo within a photo editor, selecting simple blocks of audio, or carefully outlining just the unwanted noise itself. Each new generation of iZotope's RX becomes a little more complete in terms of the audio repair tools provided, with a variety of tools that work in the time and frequency domains. 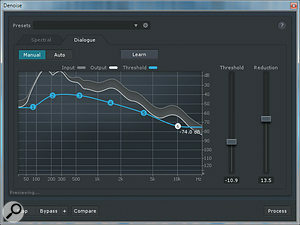 It also becomes easier to use and, more importantly for some, faster at processing audio too. The latest incarnation, ingeniously named RX3, is fundamentally an incremental evolution from RX2, but with a couple of brand-new modules, improvements to several existing processing modules, and some significant new working practices including a new RX Document archiving format. The program graphics have also been restyled to look a little more modern and professional — it's all muted blue-greys and sharp white typefaces now — but the central layout and structure is much the same as RX2, so existing users face a very shallow learning curve. Generous upgrade deals are available for existing RX or RX2 users. In total, RX3 apparently boasts around 100 improved features and functions over the previous versions and, like its forebear, is available in both Standard and Advanced versions, with fairly predictable feature-set differences and a corresponding price differential. For new users, basic operation is fairly obvious and straightforward, but a program as complex and versatile as this does take some time to fully master. The (downloadable PDF) handbook is very readable and helpful, though, and the iZotope web site has many excellent instructional videos which are thoroughly recommended. All of the fundamental restoration processing modules are common to both versions of RX3, and most can be used in either a stand-alone form or as a plug-in within a host DAW (See System Requirements box). This 'base set' of modules includes de-noise, de-click and de-crackle, spectral repair, de-clip and de-hum, along with a six-band parametric EQ, a channel/phase control module, a spectrum analyser, a spectrogram display, a sample-rate converter, a dither module, support for third-party plug-ins, and monitoring and recording facilities. The last allows RX3 to serve as an independent audio editor. It's worth noting at this point that the plug-in hosting, MBIT dither and SRC modules included here were previously only available in the Advanced version of RX2, and I think that moving them into the standard edition of RX3 is a very sensible decision. Both the Standard and Advanced suites also benefit from unlimited undo history, a file batch processor, and iZotope's new RX Document feature, which is a bespoke archive file type enabling projects to be saved in a native format (see box). 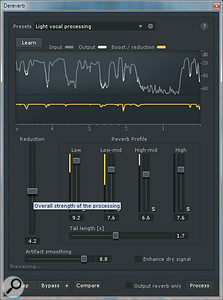 As with the full-fat version of RX2, RX3 Advanced adds numerous more sophisticated and specialised facilities, including a de-construct module, which separates the noise and tonal elements of a complex signal, allowing each part to be processed independently, as well as a brand new reverb removal module and a new dedicated dialogue noise-reduction process. It also includes some more sophisticated processing modes within the standard de-noise, spectral repair, de-clip, and de-click and de-crackle processes. These embellishments are really aimed at expert and professional users who require the ability to squeeze the absolute maximum from these processing algorithms — I should emphasise that the standard versions are all extremely capable processing tools that meet the needs of most typical applications. The RX3 Advanced version also features a time and pitch manipulation tool, some more complex modes in the channel/phase module (centre-channel extraction and azimuth correction), and the complete iZotope Insight metering suite plug-in. It also allows the entire time-stamped processing history to be exported as an XML file for 'audit trail' purposes in forensic work. Simply because it is a self-contained package, the first new element I should comment on is the inclusion of the Insight metering suite. I think this is a very sensible and helpful addition, because 'seeing' an audio fault or problem often provides a very helpful first step in identifying how to deal with it. Rather than describe the entire suite again here, though, I'll refer you back to my full review of the iZotope Insight Suite in the March 2013 edition of Sound On Sound (/sos/mar13/articles/insight.htm). Suffice to say here that it is a very comprehensive suite of different metering tools and displays, with considerable flexibility and in full compliance with the latest Loudness Metering and True Peak standards. Amongst the most significant brand new features of RX3 itself is the dialogue de-noiser in the Advanced version, Perhaps the highlight of the new features in RX3 Advanced is an impressive reverb removal algorithm.which is presented as a new sub-page of the existing de-noiser module. In essence, this processor employs 64 psychoacoustically spaced band-pass filters instead of the thousands involved in the standard de-noise module's spectral footprint-based approach. This reduced set of filters is optimised for dialogue applications, and intelligently detect and reduce unwanted non-speech content based on six user-adjustable frequency threshold reference points, making the module very quick to set up and extremely effective in use. This tool is intended primarily for video producers, broadcasters, podcasters and similar applications where the wanted dialogue is unavoidably compromised by background noise, and the plug-in can be used in real time within a video editing platform, as it introduces minimal latency. Like most RX processing tools, it features both fully automatic and manual modes to optimise the threshold settings. The de-click and de-crackle module in the Advanced version now includes some extra parameters to help improve the treatment of lower-frequency clicks and discontinuities, and the usual preset starting points are included for a range of impulsive noises such as mobile phone interference, digital clicks, thumps, and all the usual vinyl clicks and crackles. I emphasise the phrase 'starting points' here: presets can be very useful, but they are inherently designed without any knowledge of the specific condition of your own material and so they always need to be further optimised by the user to some extent. The de-clip module has improved graphics which make it rather easier to see the extent of clipping on the audio waveform and thus optimise the settings, while the Advanced version also allows clipping thresholds to be adjusted separately for positive and negative peaks. The major highlight of RX3 Advanced is undoubtedly the de-reverb module The new dialogue de-noising module in RX3 Advanced is optimised for real-time use within video editing packages.— which, as its name implies, attempts to reduce the reverberation captured in a recording. The algorithm works best when its learning process is able to analyse 5-10 seconds of (ideally) transient-rich audio to help identify the direct sound, reverberant tail and ambient noise-floor elements. It then establishes suitable parameters which can be further optimised manually, if necessary. The module works very well at taming the reverberation in a recording, although trying to remove it completely tends to leave artifacts. I also found that several passes targeting different aspects of the reverb content (especially when there are strong early reflections) worked better than one heavy-handed attempt — the same policy is generally true for most 'noise-reduction' restoration processes, of course. 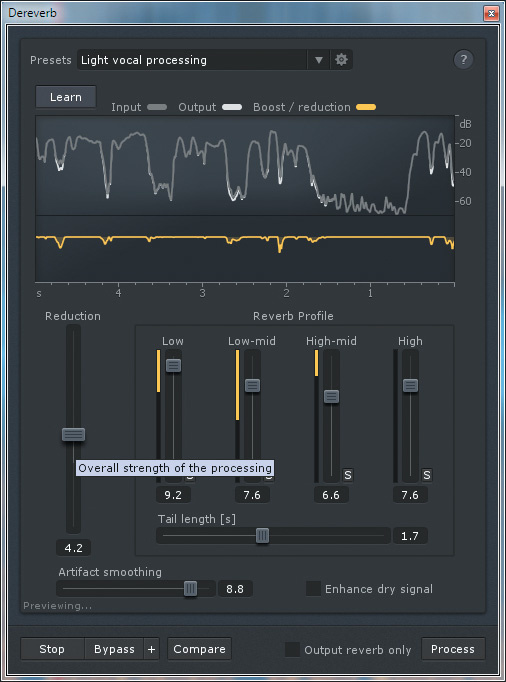 Overall, the de-reverb module is a very useful and effective addition to the Advanced Suite, helping to tighten and 'dry up' audio recorded in less-than-ideal acoustics. Many of the other updated functions are subtle improvements over those found in RX2 Advanced. Sometimes this just means that the processing runs much faster than in the previous versions, but there are some very worthwhile workflow improvements too. In particular, RX3 now allows up to 16 files to be open simultaneously, each with its own tab along the top of the RX window, so that you can hop between them quickly. As with earlier versions, most common audio file formats are supported, although since RX relies on the resources of the host computer's operating system, some non-native formats might not be available. In general, though, WAV, BWAV, AIFF, MP3, WMA, AAC and SD2 files can all be used, and the audio can also be extracted from several video formats too (AVI, MPEG, WMV, MOV and M4H; MOV files require QuickTime on the computer and only work in the 32-bit versions of RX). 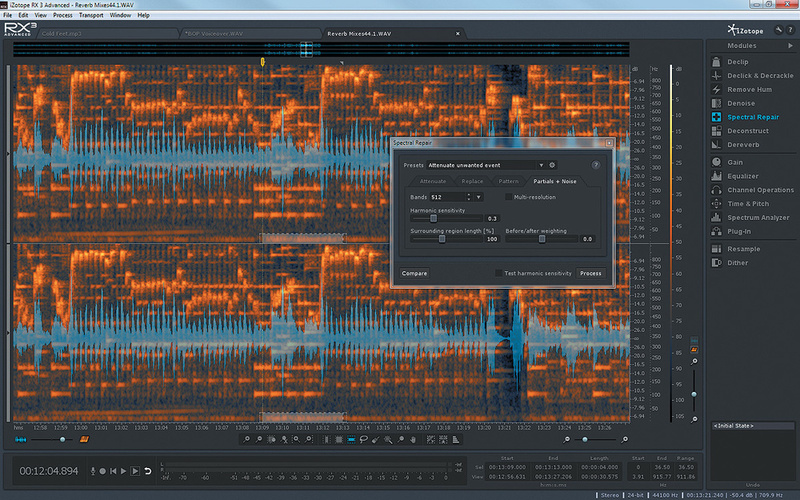 This latest edition of iZotope's RX3 represents a useful step forward for this superb audio restoration suite, with the new RX Document feature and worthwhile refinements throughout. Inevitably, the best is reserved for the Advanced version, with the impressive new dialogue de-noise and de-reverb modules, but even so the standard suite includes a very powerful set of tools for fixing most of the commonly encountered audio problems, or for modifying sounds in remarkable ways. Several other companies, such as Waves, Sonnox, Sony and Adobe, offer alternative audio restoration processes, either as plug-ins or integrated into their audio editing platforms. But none are as comprehensive or effective as iZotope's RX in my opinion, and you'd have to go to the much greater expense of something like CEDAR to find significantly better performance. One major restoration function which I would love to see added in a future version is a wow and flutter removal tool — something like Celemony's Capstan, for example. But overall, even the considerably more expensive Advanced version of RX is hard to beat in value-for-money terms, and the ability to run so many of the modules in both stand-alone and plug-in forms makes this a very powerful and versatile package. There is a learning curve, of course, but the rewards from spending a little time and effort in getting to grips with the functionality are immense, and it is quite astonishing what can be achieved with RX3 given some expertise! Highly recommended. The CEDAR Cambridge suite of audio restoration and forensic tools is the ultimate package, but is considerably more expensive than RX3 Advanced. 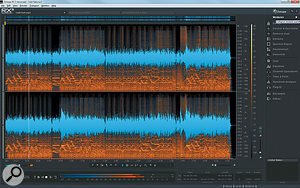 Various noise-removing tools, spectral editors and other signal manipulation tools are available from the likes of Waves, Sonnox, Sony and Adobe, amongst others, but none offer the same kind of integrated, comprehensive suite, with both stand-alone and plug-in flexibility, as iZotope's RX3. Previous versions of RX only allowed a modified file to be saved over the original, or as a renamed alternative in a specified file format. However, in both cases you were only saving the final, edited and processed form of the audio. While that was fine for most cases, it made life difficult if you subsequently needed to go back and tweak some aspect of the processing. Those same Save and Save As... options are retained in RX3, of course, but now the actual editing session can be saved in iZotope's new RX Document format, which preserves the complete undo history of the work in progress so that edits and processes can be reworked as necessary later. It also preserves audio marker positions for easier navigation. The RX Document format is surprisingly useful and I have switched over to saving all my RX work in this format, just to provide the option of quickly tweaking something after the event if I need to. RX3 can be used with Windows XP, 7 and 8, in both 32- and 64-bit versions, or with Mac OS 10.6.8 or later, on Intel-based Macs only. The current release is v3.01 (October 2013). Most of RX3's modules can be used in either stand-alone or plug-in configurations, and plug-in support is provided for AAX 64-bit (Pro Tools 11), RTAS/AudioSuite (Pro Tools 7.4-10), VST, VST3 and Audio Units. However, the Spectral Repair plug-in is not a real-time algorithm and requires a host application that supports off-line processing (such as Digital Performer, Pro Tools, Sonar, Cubase, Audition, and many more). Where this support is not available (for example in Logic, Ableton Live, and a few other DAWs), Spectral Repair should be used in its stand-alone mode. 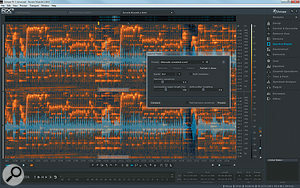 Full details are available on iZotope's web site: www.izotope.com/support/portal/index.php/kb/article/395. A very impressive and comprehensive collection of audio processing tools. 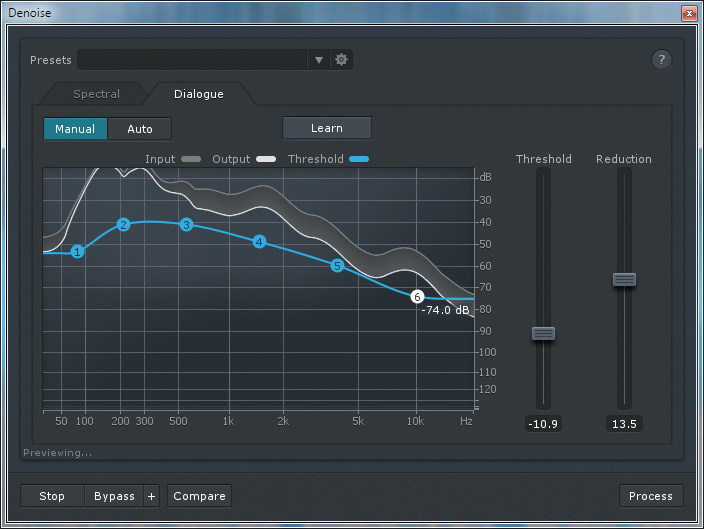 New dialogue de-noiser and de-reverb tools in Advanced edition work well. RX Document and multi-tab features offer real benefits. The Advanced Version is pricey — although actually very good value for those who genuinely need its capabilities. It requires an investment in time and study to really use it to best effect. RX3 Advanced improves upon the previous version with some helpful new workflow features, two impressive new tools in the form of de-reverb and dialogue de-noise modules, and the inclusion of iZotope's excellent Insight metering suite. The standard version also benefits from the workflow improvements, and gains the dither, plug-in hosting and SRC functions which were the preserve of the Advanced version of RX2. RX3 £219; RX3 Advanced £839. Prices include VAT. RX3 $349; RX3 Advanced $1199.